We LOVE pizza at our house and we have a weekend tradition to make our own personal pizzas. We give each person in our family an 8″ cake pan and they then get to roll out their dough in their pan, put on the amount of sauce that they want, and load it with whatever toppings they choose. We lay out all the toppings and let the kids just go to town . . . it is hilarious what they come up with! And this is one meal that I KNOW they will eat all their dinner because they made it themselves. 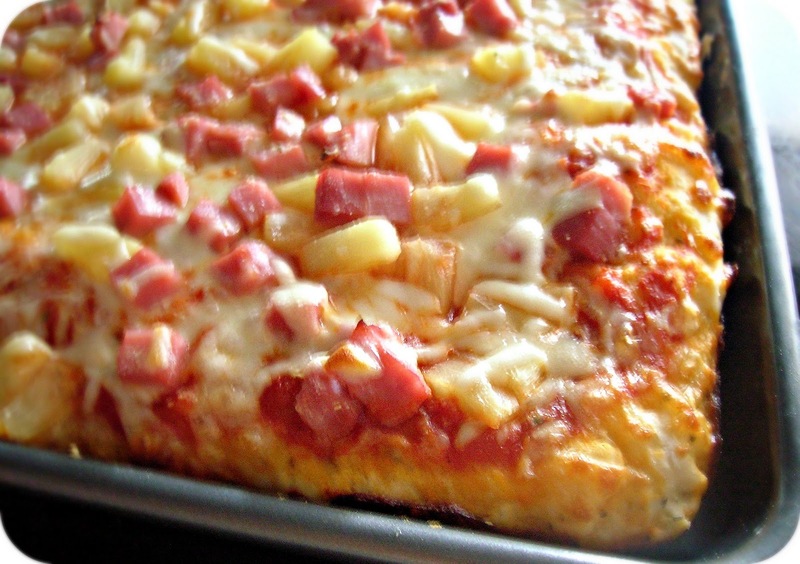 We have tried lots of pizza crust recipes over the years and this one is our favorite! It makes a thick, delicious crust (kind of like a Pizza Hut pan pizza) and we absolutely love it. In a large bowl, dissolve the yeast and brown sugar in the water, and let sit for 10 minutes. Stir the salt, Italian seasoning, garlic powder, onion powder, Parmesan cheese and oil into the yeast solution. Mix in 2 1/2 cups of the flour. Turn dough out onto a clean, well floured surface, and knead in more flour until the dough is no longer sticky (sometimes I need more, sometimes I need less- it kind of depends on the weather and the humidity in the air). Place the dough into a well oiled bowl, and cover with a cloth. Let the dough rise until double; this should take about 1 hour. Punch down the dough, and form a tight ball. Allow the dough to relax for a minute before rolling out. 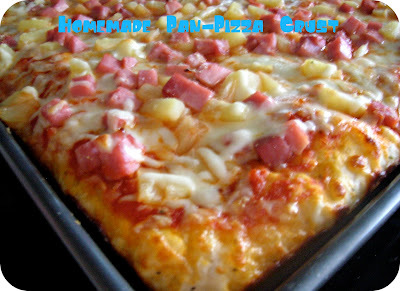 Use for your favorite pizza sauce recipe (I just like to use Prego Traditional spaghetti sauce) and favorite toppings. Preheat oven to 425 degrees F (220 degrees C). If you are baking the dough on a pizza stone, you may place your toppings on the dough, and bake immediately. If you are baking your pizza in a pan, lightly oil the pan, and let the dough rise for 15 or 20 minutes before topping and baking it. Bake pizza in preheated oven, until the cheese and crust are golden brown, about 15 to 20 minutes. I will also bake the pizza crust on a large 17x12x1″ cookie sheet and it works perfectly. We also cook it on a pizza stone (it makes about 2 12″ pizzas) and in 8″ cake pans for individual pizzas (it makes about 5 pizzas in the cake pans). 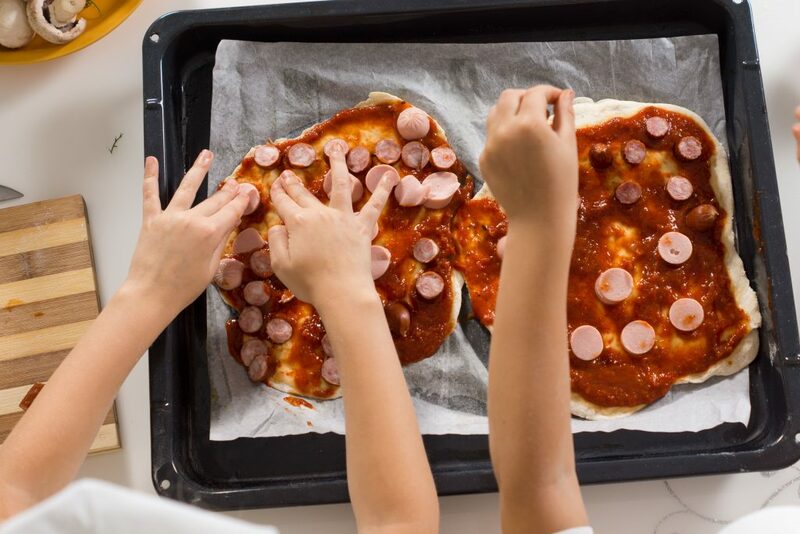 It’s fun to watch the kids load their pizzas- sometimes they even branch out and try new toppings. We then pop in a movie and have a Movie Night while we eat our homemade pizzas . . . it’s one of my favorite things to do. We hope to continue this tradition while our kids grow up and include their friends when they become older. Oh I love this tradition! I want to start it when I have kids. Also, I can't wait to try out your crust! I've been looking for a good one. How did I miss this?? This looks so good! Thanks for always supporting Show & Share with your great recipes! I appreciate you! I just found your blog on pinterest and then wandered over to the recipes... I have made this pizza crust twice in the past week... SO GOOD! Thank you for sharing. You're recipe section is a goldmine!!! In a 17x12x1" cookie sheet do you let it rise 15-20 minutes before topping and baking it? YOU DIVA'S ARE AMAZING !!!!!!!!!!!!!!!!!!! I made this dough for last night's dinner and I wanted to report: Oh.My.Gawd! It's fantastically delicious! My husband (the usual pizza maker in this house) even said he liked it better than HIS dough recipe. WhOOt! I love the taste, the texture, the fluffiness and the handle-ability. Gosh, I'm drooling now, anticipating making a second pizza from the other half of the dough! Thank you for sharing this recipe with us, Sisters! It is now THE recipe in this house!! Can this dough be frozen? if so, what would the steps be? We have never frozen it before so we searched on the internet for you. This is what we found.... You can freeze a homemade dough at essentially any point in the process and it'll work just fine. When I make extra dough to freeze, I'll let it perform its initial fermentation (including a cold ferment if that's in the recipe), divide it into individual balls as if I were going to allow them to go through their final proof. But rather than proof them, I'll stick them on a plate or a rimmed baking sheet lined with parchment paper and toss them in the freezer. Once completely frozen, the balls can be thrown into a zipper-lock freezer bag. To use them, I pull out as many as I need and allow them to proof as normal (either in an oiled bowl covered with plastic wrap, or on a floured wooden board, covered with a floured towel or plastic wrap), tacking on an extra couple hours to allow them to defrost before they really start to rise. Hope this helps! We make homemade pizza a lot in our family and my husband told me that this is his favorite dough so far! I loved the seasonings in it. Hubby and I make pizza once a month. Recipes taste best when made with love Hugs! We have only made this pizza crust as directed in the recipe. If your bread machine mixes it like the recipe, then you could put into a greased bowl to rise.